So I finally received the pickguard. 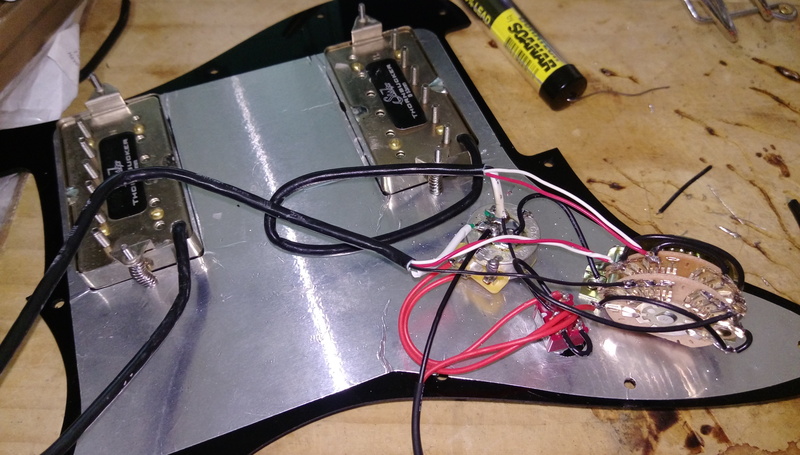 Humbuckers fitted nicely, not so the CTS pot… so I had to enlarge the pot hole, and also drill a new one for the blower switch. 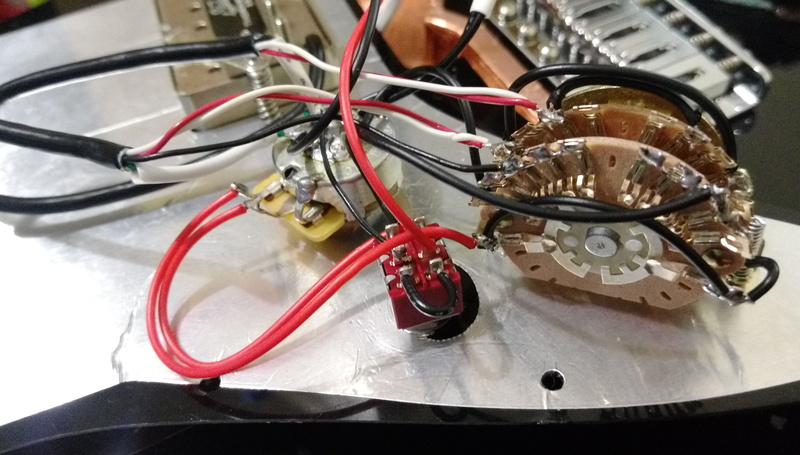 I’ve to admit that I hesitated to drill the hole, and contemplated to use a push/pull volume, but my reasons to use a DPDT on-on were still very valid, so I ended up going on the original path and drilled the hole. When I went to mount the pickguard, I noticed the super switch was making contact with the side of the cavity. In fact it did not fit. so I had to flip the switch around, and re-do poles 0 by inverting the cabling so the switch would still work on the right position and right order. I also swapped the DPDT switch for a different one which was easier to operate. Hopefully it will last the time. And this is what it looked like on the guitar. Notice the bridge saddles were also changed. I replaced the standard Fender vintage saddles with a set of Goth S21C steel saddles. I found these to be more comfortable for playing, specially as I do a lot of palm muting. 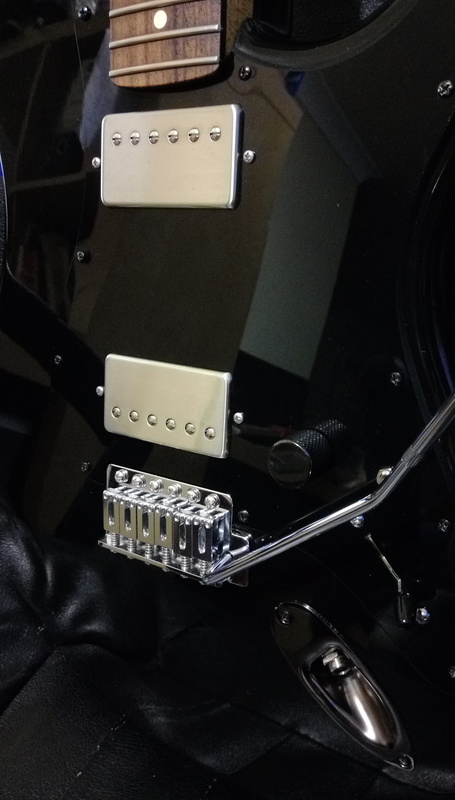 The blower switch is behind the tremolo bar. The guitar with strings and intonation and action adjusted. Also note the volume know was replaced with a chrome one, as I think it looks much better. and yes, it sounds amazing. I’ll upload some soundbytes soon. 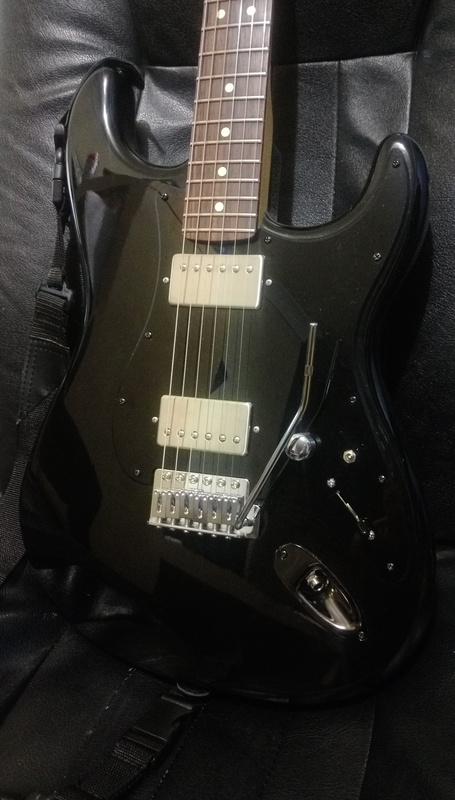 This entry was posted in Black Strat, Electronics, Hardware and tagged Blacktop wiring, Fender 4P5T, Linear Taper, Partscaster, Stratocaster, Suhr Blower Switch, Surh ThornBucker on June 28, 2017 by Andres Munoz.